Our Products >> .500-.465 N.E. by Holland & Holland, FMJ, 1 Cartridge not a box! 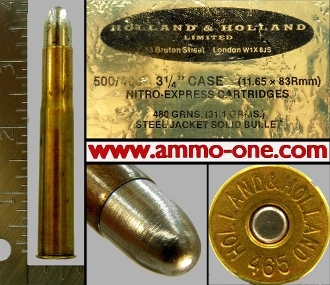 One Cartridge, not a Box: 500-465 Nitro Express by Holland & Holland using Holland and Holland brass cases with "HOLLAND & HOLLAND 465" Head-Stamp loaded with an unusual, ribbed, 480 Grain Steel Jacketed FMJ (Full Metal Jacket) Projectile with small nickel primer. Nice Patina, minor very small spots, if any. The .500/.465 (3&1/4") Nitro Express was introduced by Holland & Holland of England to answer the demand for a cartridge more powerful then the 375 H&H Magnum (375 Holland & Holland Magnum) . At close to 5,000 foot pounds of energy this cartridge has as much energy at 200 yards as the 375 H&H Magnum has at the muzzle. .500-.465 N.E. by Holland & Holland, FMJ, 1 Cartridge not a box!